Alabama residents looking for emergency cash loans have multiple options. You could apply for a loan at the bank, or you could drive to a cash advance store in your area. 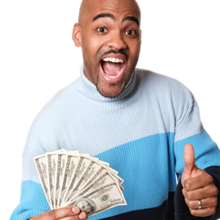 Of course, you could save time, money and gas by simply going to CashLoan.org where you can have that emergency cash in an hour or less. CashLoan.org can help you immediately- no credit checks, just the money you need to get out from under your economic problem quickly. You can APPLY NOW online, or you can contact us. Residents in most states can take advantage of CashLoan.org's reliable, confidential and secure service. Alabama state law exempts cash advance lenders from small loan and usury laws (often referred to as "Safe Harbor" legislation). This means that there is no limit to the number of outstanding payday loans an Alabaman resident can have- as long as the total does not exceed $500. After paying off two back-to-back loans, the customer is allowed to take out another loan after a waiting period of one business day. Loan terms vary- they can be anywhere from 10 to 31days. Alabama law permits one extension or rollover. Finance fees cannot exceed 17.5% of the amount borrowed. If the borrower defaults, the maximum monthly finance fee is 3%. There is an ongoing debate about whether or not payday loans are covered by the Alabama Small Loan Act, which prohibits making loans for $749 or less without a license. The banks tried to stop check cashing companies in 1998, but in June of 2002, there was a court ruling handed down by Judge Eugene Reese allowing lending operators to bypass the small loan laws and to continue to offer payday loans.